Having had a great dinner and a soft bed, I slept well during the night, but now the sky in the east is becoming increasingly light and I know it’s time to break camp and head up the trail. There were a couple of other hikers stirring as I stepped back onto the trail and I greeted them as I passed by them. A few miles up the trail, I stopped to get a liter of water, and met a hiker who went by the trail name of Bow. His pack was half the size of mine, and I concluded he was an ultralight hiker. We exchanged greetings and he said he was waiting for friends who were in camp last night, a couple of fellows from Israel. I had already entered Lassen National Forest and in a few miles I entered Lassen National Park, just before a small lake called Little Willow Lake. The land inside the park was like a miniature Yellowstone, and was set aside as a park by President Theodore Roosevelt in 1907. The area within the park is still volcanically active, the source of the activity being the conjunction of two plates off the Northern California coast, one of which, the Gorda Plate, is slowing diving below the North American Plate. The heat generated by the grinding of two land masses against each other can be observed in the boiling mud pots at Boiling Springs Lake, the churning hot springs at Drakesbad Resort, and the stinking fumaroles of Terminal Geyser. The trail passed by each of these natural oddities and I took the time to observe them. I was anxious to get to the Drakesbad Resort, as Yogi’s guidebook said that hikers can get a shower, do their laundry, buy a restaurant meal, and soak in the resort’s hot springs. Being in the national park, I believe the resort was operated as a park concession. The Park Service purchased the resort holdings from the Roy Sifford family in 1953 for $325,000. Roy’s father, Alexander, had purchased the land and outbuildings from Edward R. Drake in 1900 for $5,000. The trail came close to the Drakesbad Resort, but didn’t go directly to it. At a junction in the trail, I stood opposite a wide meadow and could see the resort in the distance, nestled among towering pine trees. The meadow was once a swampy marsh that Alexander Sifford had drained in order to grow alfalfa. It was not possible to cross the meadow to the resort as there was a wide and fairly deep stream just out of sight in the bushes preceding the meadow. The trail was well marked and the signs informed the hiker that taking the left-hand fork would take the traveler to the resort, while the right-hand fork would bypass the resort and take the hiker to the Warner Valley Campground. I chose the left-hand fork. It crossed over streams and marshlands and connected to a horse trail that lead to the horse corrals, the resort lodge and dining room. 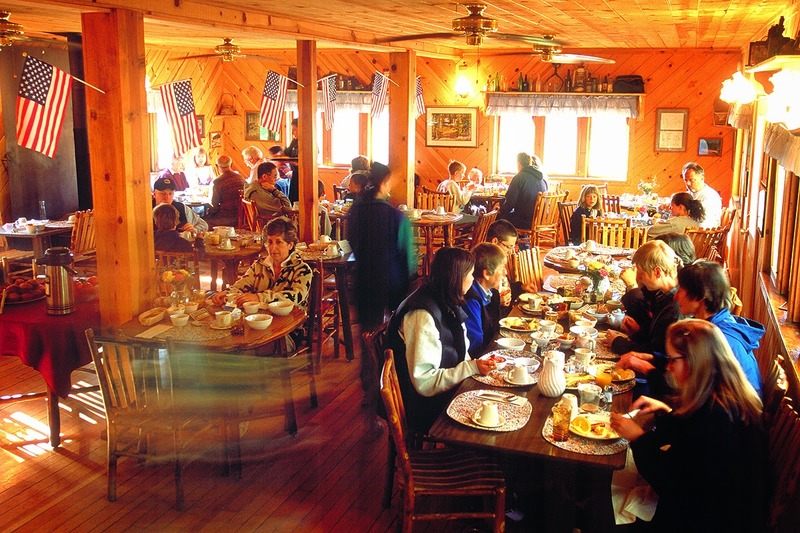 I was really hoping to purchase a meal in the dining room, even though I knew that the quantity of meals prepared were for the guests first, and if there was any food left over, hikers could purchase it at a reduced price. I approached the dining room door, opened it, and looked around. A young waitress was standing by the cash register and I asked her if it was possible to purchase a meal. She told me what I already knew, but she said she would ask the chef. The chef’s reply, seeing that there was only one more mouth to feed, was in the affirmative, but because I was dirty and didn’t smell so good, I elected to take my meal at a table and chair on the outside patio. While I was waiting for the appointed dinnertime, I asked the waitress where the laundry facilities were located. She said they were behind the dining hall. I went out back, expecting to find some type of building with the laundry facilities located inside; what I found was a stackable washer and dryer sitting on a cement pad adjacent to the back wall of the dining room kitchen. The machines were coin operated, but there was nowhere to purchase laundry detergent. I asked one of the kitchen helpers about the soap; he disappeared into a side building, and then reappeared moments later with a bottle of concentrated liquid detergent. I found the bathroom, went inside and stripped off my dirty clothes and put on my raincoat and rain pants, then placed my bare feet in my hiking shoes, and returned to the washer and dryer. To get to the dirty clothes in my pack, I had to empty the contents of the pack onto a tarp I placed on the ground. With everything loaded into the washer, including a hefty dose of concentrated liquid soap, I put the required number of quarters in the machine, turned it on, and returned to the restaurant patio to await my meal. Even though the patio could sit a large number of people, I was the only one present; all other guests had elected to eat inside the dining lodge. The waiter brought a menu, which only had one dinner item listed on it – the special of the day, which was a stuffed pork chop with side dishes, dessert, and wine, for a total of thirty-six dollars. I declined the wine, which saved me twelve dollars, and invited the waiter to bring me the first course. The meal was good, really tasty, and at twenty-four dollars it would be the most expensive meal I would have on the trail, but I felt I deserved this small luxury. Surprisingly enough, I was the only hiker present at the lodge; had there been two or more of us, probably none of us would have been able to purchase a meal. A well constructed bridge spanning a chasm. The mud pots at Boiling Springs Lake, in Lassen National Park. Two hikers, former educators from Canada fording a small river: Forget-me-Not and E-Path. A boardwalk through a marshy area leading to Drakesbad. The dinning room at Drakesbad. First comes the fire, then the blow downs. I believe that beetles may be at work in this section of the forest.